Okay, first grade friends! 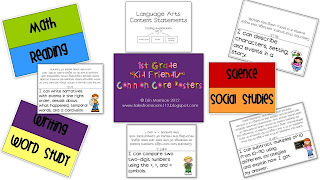 I've finally completed the First Grade "Kid Friendly" Common Core Standards Posters. I have had many requests for these and have been working on them for quite some time. I am exited to share them with you! This document includes ALL standards for Language Arts (reading, writing, language, etc.) and Math. Also included are subject heading cards for your display, information explaining how to read the coding on each card, and directions on how to print and make the cards. Making the cards is very simple-- you just need to print, cut around the solid black line (but DO NOT cut the line in the middle) and then fold in half. One side will be the "teacher" side and the other is the "kid-friendly" side. Just laminate, if you wish, and display in your classroom to make the learning goals more visible to your students! Check them out... Just click on the picture above to be taken to the link! I hope these posters help you with the new transition to the Common Core! Ditto what Heidi said! I like how they have both teacher & student language. They look great Erin! I have all of my objective posters ready to go for next year! Thanks again! I've nominated you for a Versatile Blogger Award! Stop by my blog to pick it up! You have been awarded the Versatile Blogger Award! Come over to http://mrsriosteachessecondgrade.blogspot.com/ to pick it up. Love the idea of having the standards in "kid-friendly" language. I am glad I found your blog!